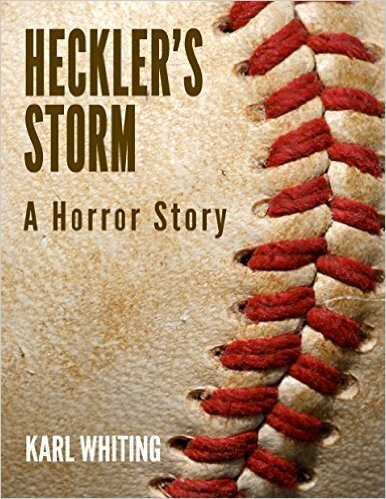 A baseball field doesn't seem the natural home for a horror story - the bright sunshine, the innocent simplicity of the game itself... and yet, here we have Heckler's Storm, and if the hairs on the back of your neck don't prickle through this, I'll be surprised. Karl Whiting takes a simple piece of American life, and twists it around into something creepy. Craig is a shortstop who is failing, struggling to keep his career going in the minor leagues. He knows he's not been good enough, and that air of desperate failure gnaws at the inside of his mind. One hot afternoon, with his cap missing and sweat curdling on the back of his neck, he frets and fears about everything. Then, as he steps up to bat, he hears it. A heckler's voice. A disturbing voice that cuts through the regular noise and hubbub of the crowd and tells him that he is blighted. That his team is blighted. Told entirely from Craig's perspective, it's hard to tell what is real and what is imagined in this feverish little tale of a sportsman whose career is on the slide. But from start to finish, Whiting keeps the pressure on, keeps you wondering where it's all going to end. Even when that end comes, it leaves you asking questions, asking how would the rest of the world have seen the same incidents. It's a short tale - under 20,000 words, but ignore the word count, and enjoy - as Whiting hits a home run. Heckler's Storm is available on Amazon here.